Certification and Control procedures will be carried out by an external independent certification body which by means of its technicians , will check the compliance with the standards. These Standards should be regarded as a mere guideline which is suitable to changes and modifications. In particular, Annex 1 was elaborated according to the European Inventory of cosmetics raw material enclosed in the Decision of the European Commission of February, 9th 2006 (2006/257/EC). Changes to this official inventory lead to subsequent modifications to this Standard. Raw materials not included in the official European inventory will be evaluated by the Technical Commission of the certification body. In body care/treatments: the use of environmental friendly beauty products which take care of the consumers’ health. Moreover they should be able to satisfy every particular need through a precise and clear definition of organic, environmental friendly beauty products. 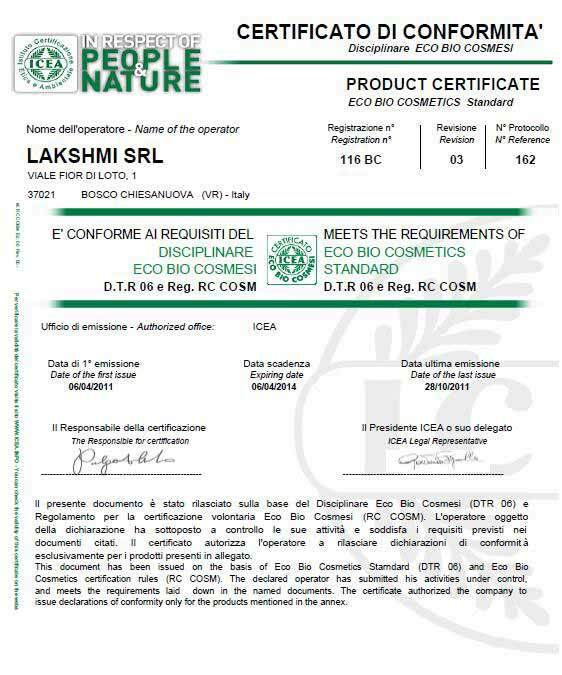 The Definition of the basic requirements for the products "Eco-BioCosmetics”, which are listed in order to give the mark reported in Chapter 2, paragraph V.
contained both in product and packaging). dangerous i.e. allergic or irritant substances or anyway harmful for the human health. immediately the really natural ones.